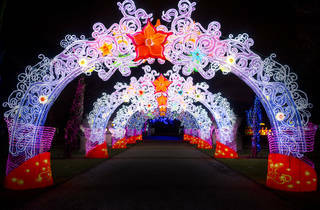 Grab an eyeful of some seriously beautiful illuminations at The Magical Lantern Festival in London. Please note, discounted tickets booked through Time Out allow access from 7pm only. To visit from 5pm, please book direct. I have to say, I was quite disappointed by the Lantern Festival. Whereas the beauty and splendour of Chiswick House and Gardens can be enjoyed at most times of the year, the festival added little too it. The lanterns themselves seemed well enough designed and the ingenuity in the odd piece really jumped out, particularly where they complemented their setting (the Flamingos spring to mind). But after 20 minutes, everything just seemed to be more of the same. Whilst I understand the necessity of a one-way system, this made the experience feel very linear and the lack of any sort of other entertainment (music, foodstalls etc) didn't help. It seems to me like the lanterns would have been better separated and placed around the whole city, akin to the Swiss Cows. When they are all amalgamated, they sort of lose their charms. It almost seemed like amateur photography hour wandering around with about 95% of people endless snapping away, mostly on their phones. This hampered the view of a fair few sets of lanterns and gave the event a very different feel. My biggest gripe, however, is with the price. It just doesn't seem worth it to me. Whilst I liked the idea, the fun wore through too quickly and, ultimately, I am just not sure who this will appeal to. Well, at least after the first 20 minutes. The Chinese lanterns in Chiswick House gardens never fail to impress. The stunning lanterns illuminated from the inside by lights, and their imposing sizes, are awe inspiring- one display is an actual Noah’s Ark complete with life-size animals! My favourite are always the ones along the river, their lights reflected in the water. I think it’s worth the £14 you pay for entry- not just because of the obvious amount of time and skill it takes to put this display together, but there’s also loads of them, so just when you think that’s it, you turn a corner and there’s a whole other long path filled with more lanterns. Viewings can get broken up with some hot whisky and marshmallows heated on the fire pit. And at the end there’s a bit of a mini Winter Wonderland going on with rides and more street food stands. It’s all so serene and beautiful and everyone can enjoy it as long as you’re dressed up very warm. This has definitely become an annual night out for me. Magical Lantern returns for it’s third year to the lovely grounds of Chiswick House & Gardens in London this time with the supposedly theme of Christmas. There are over 100 lanterns to see during your walk plus there is street food stands, drink stands, a Santa’s grotto and even a mini fairground with dodgems. I walk up a long path with many different snowmen and soldiers before coming to the box office where you’ll see a huge Santa and his sleigh along with his magical reindeer. On my journey I see many wonderful lanterns from Noah’s Arc to scenes from the wonderful Disney classics but in the second half after stopping of for a toasted marshmallow I then start to see a mish mash of lanterns from teapots to chess pieces which I did not like as much and was confused where the Christmas theme had gone. I feel this was a rushed Magical Lantern festival this time and no real thought had gone into the theme which was a shame as I always usually thoroughly enjoy my tour of the festival but this time I was quite disappointed. Very underwhelming. The place is incredibly difficult to find, a complete trek. The tickets are very expensive for what you get which is simply a (not even very long) walk around the grounds with very disappointing lanterns on display. Might be nice for young children/ infants to look at the lights. However, if you're after something festive, there are better ways to spend £18. Really poorly organised and executed. Don’t waste your money. There is no purpose to this event and there are no organisers in sight. The main gates were closed so everybody had to use a secondary entrance, but everyone was arriving and walking in the wrong direction. A simple sign could have resolved this issue but this was not done, why? because the organisers were nowhere to be seen. Prepare to wander aimlessly for half an hour whilst looking at unexplained lanterns. You can then optionally waste more money on food at probably the grubbiest entertainment area I have ever seen. This would never fly in east london. 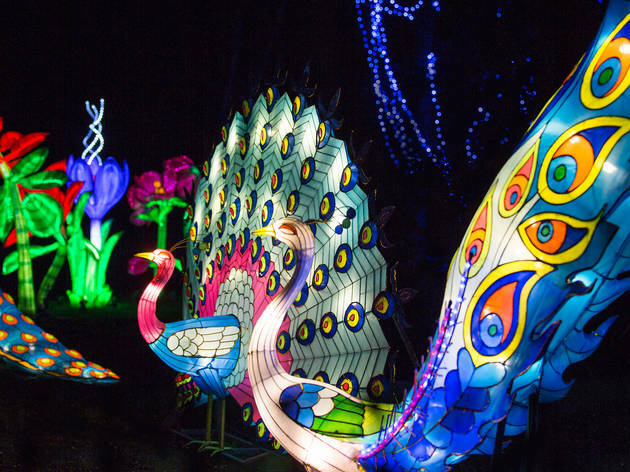 Very well spread through a handsome chunk of land in Chiswick, the Magic Lantern Festival brings a little bit of oriental cultural and beauty to London. Celebrating the Chinese New Year, there's a whole month to stroll through the endless colourful light scenes, some of massive proportions and with music and movement! Carefully crafted, each lantern group tells a little tale of legends, traditions and stories to bring good fortune to the upcoming Year of the Rooster. Pack warm, as it is all outdoors, and bring cash if you wish to enjoy the beverage and food selection (including a roast-your-own-marshmallow-pit!) available throughout the way. An eye-popping and imaginative collection of illuminated inflatables, in the atmospheric surroundings of Chiswick Park. The Silk Road theme is inspired and fun, making this an especially good choice for kids. Could be a bit pricey though. We had an allocated slot for 20:15 and it was a 17 minutes walk from the near tube station; Turnham Green. We hurried a bit and got to the entrance for 20:15 but beware! The ticket checking happens at least about 10 minutes walk away from the entrance! The actual even itself was amazing. It was so great to see these lanterns especially with the back drop of Chiswick House and Gardens. It’s family friendly and caters for all age ranges. The signs are slightly amusing as the language seems to be a direct translation of the Chinese symbols :) Nevertheless I think everyone was smiling and enjoyed the potter around the gardens looking at cute pandas, the animals from the CNY zodiac and the different Silk road stills. I wouldn’t recommend going hungry as there is minimal food stalls half way and then the majority is at the end where you can get Churros, a wrap or noodles. A really lovely way to spend a crisp spring evening during the Chinese New Year. Walking up to the event is a spectacle in itself, what greets you as you enter Chiswick Gardens is an awesome display of colours and light. The stunning lanterns and dazzling displays are spread along a never-ending path which meanders through the gardens, under twinkling lights and past streams and rivers. It really is spectacular. Our 2 year old daughter had a fantastic time, pointing out all the animals and characters. Make sure you visit in the early evening once it is dusk or dark to get the most of of it. Also, a word of advice: Be warned it is quite a walk from all "nearby" stations so make up you wrap up warm and leave yourself plenty of time to get there in time for your allocated time slot! really a must see festival. my 4 year old we enjoyed alot. the best part was the dragon,very beautiful arranged. A must-see spectacular. It is a fun thing to on a cold, boring winter evening. I would highly recommend this to anyone as an annual event to go to during the Chinese New Year festival. Fantastic exhibition. So well thought out - the route is long with lanterns spread out along it so there's no barging or jostling and everyone has plenty of opportunity for pictures without inconveniencing others. Food and toilets available along the route too - this is how outdoor exhibits should be done (take note Lumiere London!!) The colours are so vivid and lanterns really have the wow factor. Quite mesmerising, especially against the dark night sky. Helpful staff dotted all around too and a warm bar tent at the end makes for a truly wonderful experience. Bit of a trek from where I live in North London, and it was at least a 20 min walk from the bus stop (coming from Hammersmith) to the first lanterns but that didn't put me off. Don't miss out, it's really rather wondrous. 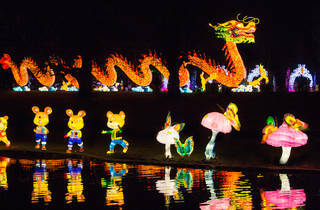 Last week-end, I went to the Magical Lantern Festival and I have to say it was worth the trip to Chiswick. I've completely been blown away by the stunning and giants structures and creatures illuminating the paths of Chiswick House and Gardens. It's perfect for an early evening out with the family or between lovers. The only disappointment is the organisation. The queuing time can be quite long due to the lack of direction - especially if you forget to print your ticket as they don't accept electronic copy. Even though it's definitely an interesting experience, kinda cool for a date and lots of fun for kids, the magical lantern festival is missing a bit of magic. There's probably a combination of reasons for that: The park is 15-20 minutes away from the closest stations and upon arrival there's queuing to get in, more queuing to pick up the tickets and then more queuing / walking around to see everything - all of these happening in the cold outdoors. Some of the lanterns are impressive, others not as much - the effort to make them is definitely appreciated - but after a point they don't come as a surprise anymore. Maybe this took place too close to the lumiere festival, which had several different installations scattered in the city, allowing for some exploration to take place - a missing element from the predefined route one has to follow in Chiswick gardens. Having said that, it's still worth a visit - especially for someone who hasn't seen anything similar - but not so sure if it's convincing enough for people to come back next time. Let me start by saying this is a very nice light festival, it is however, a bit of a mission to get to! There were not many stewards around so you didn’t really know which way to go. It took us about 90 minutes to walk round the whole thing, admittedly after an hour it did get a tad repetitive. The best view is on the bridges at either end of the grounds, where you can see the lights on both sides of the bank reflecting on the water. The huge dragon is also very impressive! It would’ve been a lot more enjoyable had there been better direction and the odd food stall about, would still recommend going for a wander around with the kids though. Everyone’s asking: “is it worth trekking to Chiswick for?”, and the answer is “absolutely!”. The show is amazing. A great evening out with a date, friends or the kids, to spice up your dark winter nights. Colourful, sometimes funny, always beautifully crafted, the lanterns are gorgeous and bring some magic and enchantment to the already charming park. The lanterns sometimes look better in the distance, so do not focus only on the closest ones to you – take your time, look around and take in all the splendour. You won’t get bored as the theme changes along the route, from animals and plants to mystical creatures and religious symbols. The event itself is well organised and you do not feel rushed or trapped at all. There are a few stands where you can buy food and drinks, but none on the walk are covered, so wrap up warm. They’re only food trucks but some are really fun – try the marshmallow one, they offer unusual flavours and even have a fire pit where you can melt them yourself. Pretty fun. And big up to the people in charge of the toilets. They look like festival ones, but they’re far comfier and cleaner. Yes to that! Ooooh...pretty...what a fabulous way to spend an evening, strolling round these striking creations, set against a pitch black sky with the Thames reflection to really set them off. You can’t help taking dozen of photos to fill your phone with brightly coloured lanterns from flamingos to dragons, ant parades and a few random pandas. It’s as colourful and chaotic as a firework display, but lasts longer with no chance of a cricked neck. We even heard a few, “Ooohs and aaahs” along the route which made it even more magical. Mark the Chinese New Year in style with this wonderful outing, perfect for kids and big kids alike. Tip: wrap up warm and don’t wear heels in case you want to get close on the grass verges for better photos. Super awesome light show. Very well organised and an amazing venue to hold it all in. I didn't find the crowd taking photographs irritating at all, I am resilient. I really enjoyed this. Most of the displays were very impressive - in particular they look good from a slight distance so make sure to not only pay attention to the exhibits directly in front of you. Given the season in which this is held (cold!) some indoor exhibits would have been nice. All in all though well worth a visit. Also, do not miss the Marshmallowist stand where you can buy unusual marshmallow flavours and roast them in the fire pit! ‘A lantern festival all the way in Chiswick Park. Can I be bothered? It’s a bit far away…’ The answer is yes! This is a wonderful use of colour, light and imagination to awaken your senses. Beautifully curated within the park there are hundreds of beautiful animals, creatures and tableaus to enjoy. Give yourself at least an hour to walk around and bring all the family. It’s worth catching. I don't often venture down to Chiswick - other than speeding through on the Megabus home to Wales - but the Magical Lantern festival was TOTALLY worth navigating the District line for. It took about an hour to make your way through the trail around the lovely Chiswick Gardens, and it really was magical. I was so impressed with the attention to detail on the delicately handmade lanterns, and how beautiful the setup was in general. If you've got kids, they'll have a whale of a time! That really sums it up - once you go through the gates you enter a different world. Everything is slowing done, while you take in the stories around you. I have already been a fan of Chiswick house and the park around it, but I have never seen it that beautiful. The lanterns turned it in a truly magical place and you feel like Alice falling down the rabbit hole (minus the Queen of Hearts). For about an hour (that's the time it roughly takes to walk through) you can take a break from everything and just enjoy the magic. I would definitely go back, as I think there are more details that I might have missed. Despite the late opening times it's worth taking your kids there as well. I went again this year and apart from a few changes (food stalls and more glitter/lights) it was still magical. What can be accomplished with some coloured paper, plastic, wire and lights is pretty astonishing. The artistry is amazing and it's a lovely evening to spend with that special someone. There was something cute, impressive and/or exceptional around every corner and the name really is fitting for the display, it's magical! As I live in Chiswick neighbourhoods' I immediately bought this ticket as Time Out offered a discounted rate ticket! I have never seen any lantern festival as this Chinese lantern festival located in the Chiswick House Gardens. The Lanterns shine through the beautiful park in the night and reflect on the lake, it is breathtaking and at the same time so original. The variety of lanterns is amazing, the tour through the park took us about 2 hours and you get to feel it time flies! There is a large variety of lanterns and colours which will allow you to take as many original photos as you want! The dragon tops all the lantern to me, it nearly looks real. the show runs until Th March, I may visit one more time!!! do not miss this amazing show!! What a magical place this is indeed! I have been to few light installations in parks but this one tops them all. Everything is magnificent and has such attention to detail, and the theme itself makes it even more special. There is quite a variety to it and makes it for good photo session, for all the eager photographers out there. You do need shoes in which you can walk around in mud though and entrance to the park isn't the easiest to find. 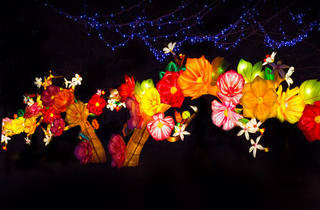 So dress in warm clothes and comfy shoes and enjoy beauty that is Magical Lantern Festival! Really nice evening walk around Chiswick House Gardens for this extensive lantern extravaganza. This is definitely worth the visit, it’s a good hour walk around and a total dream if you like taking pictures. However having visited on the first night it did feel as though there was some tidying up to be done. There were zero signposts as you approach the event, a very risky move considering the location and the scale of the event. The park pathway itself was often slightly unsafe, needed some path lighting (ironically being a light festival) and the atmosphere would have been much much better with music and food/drink stalls dotted around. I felt like the event could and should have been an absolute smash, as its there for a prolonged period I hope they make those small additions to improve the experience for future visitors! This Lantern Festival is like nothing I've ever seen in London before. To be fair, it's like nothing I've seen anywhere before – bright, colourful, vibrant and dazzling. Laid out around a path which weaves in between monkeys, flamingos, pandas and blossoms to name but a few things, it takes about an hour to walk around and there's no shortage of things to see as you do. Wrap up warm and wear shoes you don't mind getting a little muddy as the path, while sturdy, is also quite muddy. While some illuminations did seem reminiscent of Chinese New Year – the spectacular giant dragon was hugely impressive – there were some parts that did seem a little out of kilter – Cinderella anyone? There's a huge amount of potential here for a fun and unusual night out but sadly, there is quite a way to go before it becomes worthy of the £16 adult price tag. No music meant that the atmosphere was somewhat lacking – I'm not saying I wanted the walk round to be accompanied by the latest top 40 but a little traditional music would have helped take you into this world to a greater degree. The location is also quite difficult and time consuming to get to. A good 15 minute trek to the nearest bus stop and zero signage didn't help get you in the mood for a fun evening – yes, I knew where it was when I decided to go but I did think there were plenty of other spots in London that would have been easier to make your way to. Lastly I didn't see any food or drink to buy apart from a small café area near the toilets, certainly no sign of the street food and drink I had been told would be there and which would have made it feel a more complete and rounded evening. There were just so many ways that this event could have been better, none of which I feel would have cost the earth to put into practice. 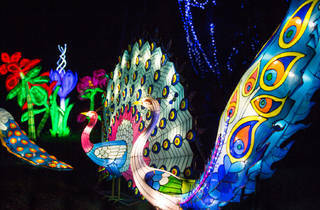 The Magical Lantern Festival at Chiswick House & Gardens were simply breathtaking. I didn't quite know what to expect - but this really exceeding any expectations I could have possibly had. The walk was so well thought out, capturing reflections and different perspectives of the lanterns. The colours, images and shapes that were used were so well-thought out. The guided walk had a great element of surprise, in that you never quite knew what would be around each corner - and the constant guessing game really added to the fun of the evening. It would be enjoyable for adults and children alike, as it would appeal to the imagination of any age. Attending this event really brightened up my February - so I would recommend to all as a must-see before it is taken down! The lanterns were beautiful and I enjoyed the walk around the gardens. It took us just over an hour to do the loop. Agree with the other comments that there should have been some music and food/drink stands somewhere. The cafe wasn't really what I had in mind. Maybe there were stalls once it opened properly? (I went on a preview night). Nevertheless, the lanterns themselves were very impressive and I later learned that used 58,000 light bulbs and four weeks to put up (three years for 100 artists in China to design). Perhaps some of this information could have been incorporated too, and/or signs about the history of Chinese new year and what people born in the various 'year of the monkey/dragon/etc' are apparently like. As a westerner, I know very little about it and didn't feel like I came away knowing more. Very disappointed as was everyone walking around at the same time as us, everyone looked thoroughly bored, I booked this as a surprise for my Chinese girlfriend, she was unimpressed too and instructed me not to book anymore surprises. She wasn't ungrateful just disappointed that What should've made her feel at home and celebrate Chinese New Year was such a let down, there were lots of illuminated things but very little do with Chinese New Year. There is Very little to eat or drink there too, high light of the visit was toasting 1 marshmallow for £1.50 each, My advice is don't waste your money, go to Blackpool illuminations instead, 100 times more to see and of a much better standard. This was a lovely event that is well worth visiting with the whole family. Taking around an hour to follow the route lined with wonderful, delicate, intricate, lanterns, you will be snapping photos all the way around. One draw back was a lack of hot food, although having been on a preview night I can't say whether there are now stalls serving food or not. Well worth the trek from the tube station! Spent 1.5 hours exploring this last night and absolutely loved it!! You've got to admire the artistry that has gone behind the creations at the Magical Lantern Festival. The sheer scale of the spectacle is really impressive - walking around Chiswick Gardens takes longer than you will expect. 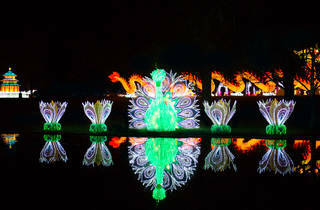 The range of the lanterns on show is vast too - from animals such as penguins (probably my favourite), to giraffes, zebras, some beautiful peacocks - right through to stunning flowers, Disney-esque scenes of princesses and, of course, a majestic, gigantic Chinese dragon. It's all really quite enchanting. Just be warned that there's not much choice of food available! This is such a beautiful exhibition! It is held at Chiswick House & Gardens, with a winding path that attendees follow round and pass by the light installations. There is a huge variety, from traditional Chinese characters to giant squirrels. My favourites were the pandas (too cute!) and the flowers. Part of the light show is along the river, and with the reflections it is truly stunning. It takes just over an hour, and there is so much to see that you are never bored. Half way round there is a cafe to buy hot drinks and cake. The addition of some sandwiches and hot food would be very welcome, as I imagine most people would be coming straight from work. I would suggest wrapping up warmly as I did start to feel cold towards the end. Overall though, a charming and beautiful exhibition, which should delight all ages and bring out the inner child in us all! Did you know we're about to enter the year of the Monkey? (Chinese New Year commences on Feb 8th). If not it doesn't matter so long as you're keen to behold the spectacle of what are effectively bright, colourful and surprisingly intricate sculptures (and don't mind wandering round in an ornamental garden in the dark). However the former will determine how much the experience feels like being teleported to the other side of the world to where the lanterns were made and the idea originates.There's a real range of styles, shapes and sizes of lanterns on display and if you're anticipating floral, animal and dragon themes you won't leave disappointed. 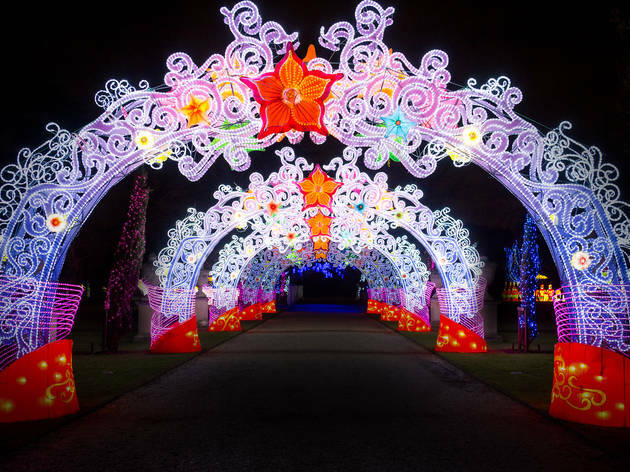 Kew Gardens have done reminiscent Christmas themed displays though with a lesser degree of sculptural intricacy, but if you fancy a full display of authentic Chinese lanterns, this is the Magical festival for you. What a wonderful, wonderful display! Such a fantastic thing to do to brighten up a winter night. The exhibition has been set up in the most amazing way, it is truly magical and entertaining. I felt like I was a little girl again while walking along the path, discovering the different animals, mushrooms and shapes around the park. Chiswick House Gardens itself is an amazing place, and with the Chinese lanterns it looks like a fairy tale. It takes just over one hour to see the whole thing, and you won't even feel it. You will also be able to take loads of beautiful photos. I feel like this is a truly unique thing to do in London, and it's unmissable! My suggestion is: don't look too much at the photos you can find online, just be patient a go there yourselves, you won't believe your eyes! Going to this Festival is a perfect night out. And if you have kids, they will be amazed! Some impressive lantern structures but the whole event could have been a lot better. Despite being advertised as such, there was no food or drink on the way around, except for the park cafe which is doesn't really do for a good night out. I was crying out for food and water! A lack of music and atmosphere made for a somewhat drab walk around on the occasionally muddy and slippery path. While some of the installations were impressive some of the lanterns were randomly placed. I've been to lantern festivals in Asia and there is definitely a lot more that could be learnt there to create a better and more fun atmosphere. Another gripe I had was that the venue is far from the centre of town, difficult to get to and there were barely any signs within the exhibit (I'm going to call it an exhibit because it lacked the necessary requirements to be called a festival) or around the area. I think this would be great for families with young children and most of the displays were dazzling but for a lot more work needs to be done to entertain the adults. I can't really recommend it as a night out with friends. This display is beautiful and a lovely sight to see. The attention to detail is amazing and the colours are wonderfully vibrant. The pieces are both clever and innovative. My only criticism is that the venue is a bit of a trek to get to and isn’t particularly close to any public transport. It also didn’t help that we were directed to the wrong entrance and had to walk halfway round the park to find the right entrance. Therefore, plan your journey properly. A must do!! Great for a date night or a family friendly event. It's stunning and really hard to describe unless you see it for yourself! It's a good 60-75 minutes walking. I went on the preview night so maybe a few things will get sorted. My only issues were there was no food even though we were told there would be, the trails got dark in a few places and most important the sign posting for the entrance for the exhibit was nonexistent. We walked a good 20-49 minutes trying to find the way in. Oh my goodness, I’ve seen my share of light festivals in these last few weeks in London but this is just absolutely stunning and worth the entry fee in my opinion. I was lucky to visit this magical and enchanting festival on one of their preview nights where there are over 50 artistic light lantern installations to see. Although it’s a 15minute walk from Turnham Green station it doesn’t take long to get there. If you turn left into Duke’s Avenue from the Chiswick High Road and continue straight along, you’ll meet a subway that leads you under Great West Road to just outside the entrance of Chiswick House Gardens and the start of the festival where you will see a few installations to give you a taster of what’s more to come inside. Having its UK premiere, this is something you do not want to miss out on. You’ll see a light illuminated safari with monkeys, pandas and deer, the chinese zodiac, a Dragon and enchanted woodland scenes and lotus flowers, light adorned trees and arches and peacocks to name a few. There were plenty of staff around to offer help and support throughout the evening. The Gardens itself provides an idyllic location for this festival that on the whole was well set out and displayed. The trail is well marked out so you don’t miss out on anything and a great way to see round and explore leading you down little hidden pathways and corners, across bridges and alongside lakes which I would love to see again during the daytime. Going on preview night there only appeared to be one café open where you could get food and drinks. However reading on their website I am aware there may be more food stalls, market areas where you can buy hot drinks and gifts and there may be interactive activities available when it officially opens on the 3rd. However bare in mind, Chiswick High Road that you may pass through offers plenty of decent restaurants and eateries if you prefer more choice. This is a great evening out for the family, friends and kids if you fancy something a little different. If you like taking photographs this would be heaven for you, but even if you don’t it’s great just to leisurely stroll around and take in the surroundings and the beauty of the lanterns around you. It is obviously outside so it is strongly recommended to wrap up warm and be prepared in case it rains, suitable footwear is wise as it can get muddy in some parts too and there are no cloakrooms either. Light up your dark winter London life by coming to this fantastic display of master crafted lantern installations spread throughout the lush Chiswick House Park. If you suffer from seasonal depression syndrome then the Magical Chinese Lantern Festival might just jump-start your engines and bring you back from the dead.There is something special, eerie, and indescribable about the power of electricity at night time. You understand how it works, but when it is seen coursing through gigantic oriental art sculptures which illuminate the surrounding trees and plants, tinging them with a touch of some ethereal netherworld, you can't help but gape in amazement. Highlights of the park's circuit included a behemoth-sized dragon, pandas eating shoots and leaves, a monkey king atop a mount celebrating his birthday (it's year of the monkey this Chinese New Year), some bulbous extra large mushrooms in a flower bed beneath an ancient twisting oak tree, and a Ming dynasty emperor with his samurai cohorts. I was lucky enough to also get a snap of a swan on Chiswick's swan lake as it swam through a watery reflection of the two giant swans that crested the banks on the other side. A swan, swanning through swan lake, swathed in the light of super-sized swans. The Magical Chinese Lantern Festival would be perfect if it weren't so quiet. The brochures promise art, culture, and food to entertain you as you pass through the park of neon wonders. But there was only one cafe open where people could stock up, on a 60-90 minute walk. Granted this was a preview night and hopefully this will change once the festival opens proper. However, I do not think there will be any music - I saw no speakers hidden amongst the tree tops, but I strongly believe the event would benefit from some atmospheric traditional instrumentation. This would offset the piercing silence of the park at night time and fully evoke the Chinese ambiance. At one point I even resorted to playing some sheng and gong music off of my phone. There also need to be dancing girls and martial artists performing outside of the huge three-story pagoda. I should have organised this thing. All told, though, this is a unique event which will not be soon forgotten, full of astonishing installations by incredible artists, and the ideal way to brighten up your life as the end of winter comes into view. Based in the gardens of Chiswick House, the lantern Festival has to be one of the most spectacular sights I've seen in London! It's set out like Ikea, there's only one way through and you have to follow the set route. 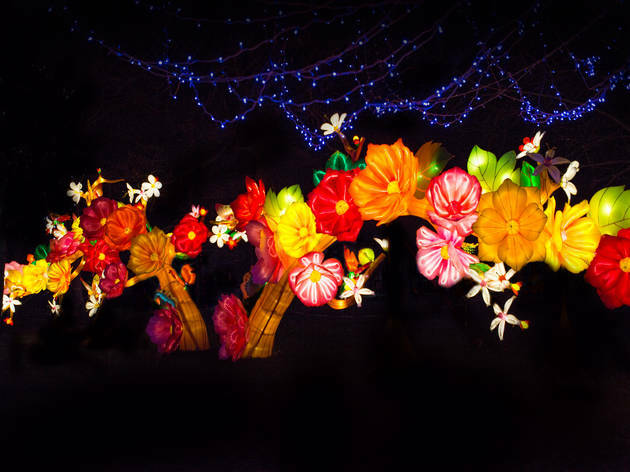 But along the way you'll spot dozens of different lanterns, ranging from decorations to animals, people, mythical animals and flowers. It was a brilliant sensation that every time you turned a new corner, a lantern would emerge and shock or dazzle you with its size or playfulness. Definitely worth going to with family or friends and taking a long walk through the grounds. A shame they didn't combine a few more activities and stalls in such as street food and music! By the end of the 70 min route or so, my eyes were almost burned out from staring at the lanterns all evening. Pick an evening with good weather and go along and relax, enjoying all the sights! And beware, the entrance for the event is at the north side of the park, not the entrance on Burrington Road! What an amazing show. I've never been to this particular park, despite living in Acton nearby. I didn't really get to see the beauty of the park because of course this show is after dark, but I was taken into a magical winter wonderland full of Chinese lanterns to celebrate Chinese New Year. This year, it's the year of the monkey so of course, this animal has its own special display. There are also many other animal lanterns lit up for your enjoyment including pandas, peacocks, deer, tigers, elephants, ants, every single Chinese year represented along a pathway, and many other lanterns to marvel at. Other displays include a huge dragon, soldiers, pagodas and even huge globes. The pathways are also illuminated with archways. It's a great place to go on a date, with any loved one or with the kids. They'll love it. Wrap up warm, as you're led through a set path round the park and you could be there for around an hour. Nice 1 hour walk around the entire park. The walkway was organised so that you didn't get a chance to wander off and you got to see everything. What you see at the entrance is only a warmup for the grand final at the end. Bring your grandparents, bring your children, friends! Enjoyable for everyone! 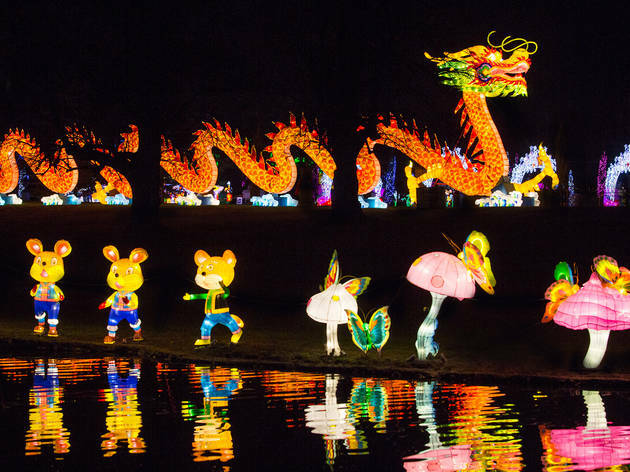 The phrase "magical lantern festival" might not sound like everybody's cup of tea but don't be fooled - this is a really fun night out with a huge range of lit up scenes and animals with a Chinese twist. The entrance proved hard to find but once you're inside there's lots to see - from huge dragons to flamingos, giant urns and even a fully sized lit up padoga made purely from fabric and (of course) lanterns. It takes about an hour to walk around the whole park and there's also a cafe halfway around where you can buy snacks if you want some food for thought as you make your way around. A truly illuminating evening! I was lucky enough to get tickets to the preview of the Magical Lantern Festival last night. What a way to brighten up February 1st! I was a tad skeptical (it's a bunch of lights, outside, in London - didn't that happen last week?!) but it completely blew me away.The craftsmanship was superb and the sheer variety kept me entertained. It's an instagrammer's dream. It proved an excellent choice of location for catching up with old friends, as there's about an hour's worth of walking among the lights. It was busy but not packed on the preview night, and I hope that it stays that way for future visitors. To sum up: it's a different, beautiful and worthwhile evening out in London. There's a nice selection of restaurants nearby in Turnham Green, so I suggest you make an evening of it. It's worth the trip! 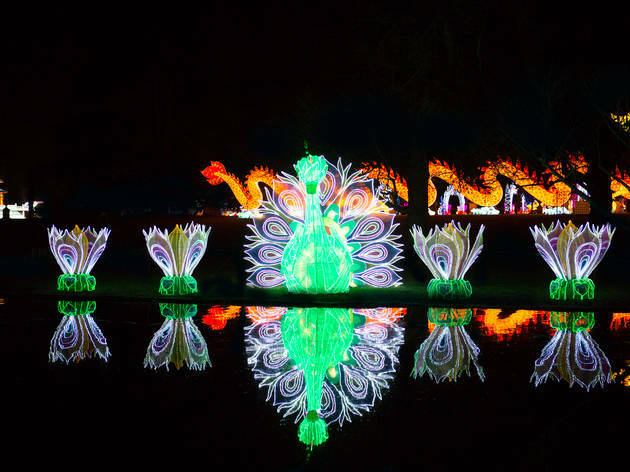 Located in the expansive grounds of Chiswick House is the Magical Lantern Festival. An awe inspiring display of larger than life lanterns that will truly appeal to all ages. Walking through the lantern route takes about an hour and there are so many different lanterns to see - from panda bears, to jelly fish to Cinderella and her pumpkin carriage. This is the first year that the magical lantern festival has been in London and I hope it comes back for many years to come! One very important thing to note: the entrance is via the north car park. Do not assume citymapper knows the correct route.